For us, the Small Conference Grant served as a catalyst to explore a topic that had long faded from the psychological mainstream. There was a brief moment in the late 1960s and early 1970s when psychologists and architects became interested in the reciprocal relationships between their two fields. This field, then dubbed “architectural psychology,” has since become integrated—and, some would say, lost—in the broader field of environmental psychology. Given our own curiosity in architectural psychology, we became interested its past fortunes and wondered what we might do to contribute to its re-emergence. We suspected that others might also have an interest in the topic, but there was no way to know for certain. The SPSP grant opportunity gave us a chance to find out. So, on December 4-5, 2016 we hosted a conference on the Psychology of Architecture at the University of Texas at Austin. We were amazed by the response to our call for presentations: we received submissions on diverse range of topics, from a wide array of academic disciplines, and from twelve countries including Singapore, Serbia, Portugal, Brazil, Australia, India, and others. The conference yielded several unanticipated benefits. First, it spurred dialogue between our university’s departments of psychology and architecture. 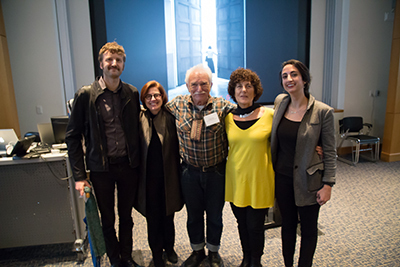 Second, it provided the opportunity to connect with other relevant academic and professional societies such as the Academy of Neuroscience for Architecture and the Austin Foundation for Architecture. Finally, these linkages led to co-sponsorships from UT’s Department of Psychology and Department of Architecture, as well as the Austin Foundation for Architecture which allowed us to provide a broader set of events in our program and host a broader selection of speakers. Hosting a conference is an especially effective and rewarding way to create connections—between ideas, disciplines, and people. We encourage you to apply for the SPSP Small Conference Grant. It provides enough support to craft a unique small meeting, catering to topics, audiences, locations, and formats that may not met by the main annual SPSP conference. The application process is straightforward and SPSP was helpful and responsive throughout the entire process. We are grateful for their support. For more information about our conference, visit www.PsychologyofArchitecture.org. For more information about the SPSP Small Conference grant, click here. Sanaz Talaifar is a PhD student in social-personality psychology at the University of Texas at Austin. Her research interests include the relationship between our identities and our moral values and how our social identities manifest themselves in the built environment. She can be reached at stalaifar@gmail.com. Sam Gosling is Professor of Psychology at the University of Texas at Austin. His research interests focus on the connections between people and the physical spaces in which they live, new methods of data collection, and personality in non-human animals.